The school logo is the letter N formed by a fluid forward motion of two separate arcs. Together they signify leadership, strength and the ability to move into the future. Traditionally Navy Blue, North Star’s primary color, is the color of constancy and faith and is symbolic of the sky and the oceans. Blue represents the ideals of the ancient navigators using celestial navigation to guide their ships to explore and reach new boundaries. Burgundy, our accent color, is symbolic of power, leadership, ambition, education, and respect. It represents the goals and ambitions of North Star High School students, faculty, and families to prepare future leaders and pillars of our community. Navi-Gator is our school mascot. The North Star High School philosophy is based on having high expectations for ALL students. We value and appreciate diversity. We will promote and create personalized opportunities where each student is actively engaged in their education. We will provide active collaboration between students, teachers and the community that creates a seamless integration of school and real world learning. North Star High School will prepare each student to live and work productively in a modern global society. Chart the course the Gators choose. Play the game, win or lose. Guides us all to truth and right. Set the standard maroon and blue. Seek the North Star day to day. North Star and the shining light. Work together, keep your stride. Standing tall with Gator Pride. Download a printable copy of the school song. In the Spring of 2000, Lincoln passed a $100 million school bond for the purpose of building two new comprehensive high schools. 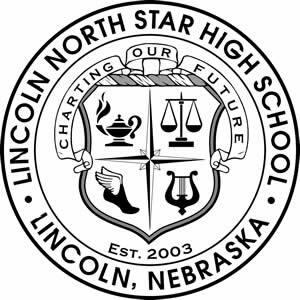 November, 2000, North Star High School was named following a student vote and LPS Board of Education approval. December, 2000, Dr. Nancy Becker named principal of North Star. June, 2001, the office of North Star High School was established at Campbell Elementary. September-October, 2001, instrumental students from Goodrich, Culler and Dawes Middle Schools assisted in the selection of the marching band uniforms. January, 2002, the hiring of administration, faculty, and staff began. June 2004 North Star Graduates it's first class - The Graduating Class of 2004!